The Alaska Miners Association advocates for and promotes responsible mineral development in Alaska. AMA also provides a wealth of institutional knowledge to assist its membership in their mining activities. A membership to AMA amplifies your voice on regulation and legislative issues and helps fund outreach and education efforts by the association, while granting you access to industry experts who can assist you. 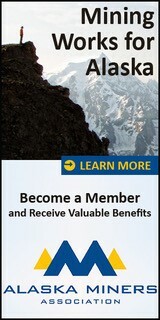 Visit the AMA Membership page to learn more about all of the valuable benefits of being an AMA member.